Paperback 206 mm x 135 mm, 320 pages. Whether music, film or favourite kinds of storytelling, there are times in all our lives when things just fall into place, when everything clicks. 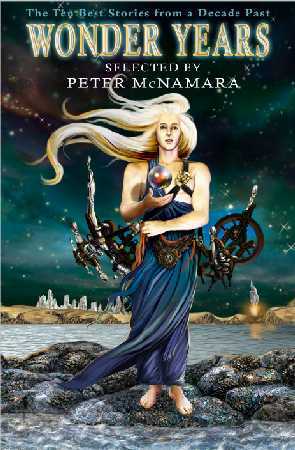 This is how it happened for Peter McNamara, internationally acclaimed editor and doyen of Australian science fiction, in selecting ten stories from the period when Aussie SF finally came of age and became a true force to be reckoned with. 'I bought Omega Science Digest for the science articles -- and by accident discovered grand SF, the stuff that really rattles and shakes and shifts your mind around, and won't let you rest until you've found more of it. The stuff of addiction. The two stories that shook me into life were Damien Broderick's 'The Ballad of Bowsprit Bear's Stead' and Terry Dowling's 'The Man Who Walks Away Behind The Eyes'. These were Australian writers, a point I wholly failed to notice at the time. 'When I set myself to select my Ten Best genre stories from the past decade, I decided I'd need a few guidelines -- other than the decade itself -- to keep things under control. One author/one story seemed the way to go, and that worked out fine (though Margo Lanagan gave me some grief). Another guideline insisted that I not reprint any story I'd published before, but Leanne Frahm's 'Land's End' -- from Aphelion's anthology Alien Shores -- proved too much. From urban fantasy to tales of myths, dreams and warriors of the future, Wonder Years plots a course across the works of the leading writers and dynamic newcomers of the genre. To purchase this book, go to the How to Order page. For customers outside Australia, go to The Australian Online Bookshop.